Not so long ago, top executives of Transpaper, a Nairobi-based dealer in paper products and boards, visited DTB Bank offices seeking a credit line to expand their subsidiary in neighbouring Uganda. At the bank, the top managers built a business case, explaining how the funds they were after would be put to use. The paper merchants sought to venture into the lucrative printing business of exercise books and notebooks, a growing ready market, in line with the company’s strategic expansion blueprint. Now, there was need to acquire an energy-efficient automated machine for the job. Armed with market data, Transpaper Uganda CEO Srinivasa Reddy put forth a cogent proposition, explaining that the Ugandan exercise books market had an estimated 10 per cent growth rate per year. This, he said, had opened wide a golden window of investment in the segment. That’s exactly how DTB Bank Uganda mentioned to the executives about availability of low-cost funds for such projects at the bank under a programme championed by the French Development Agency (AFD). The AFD-led loans fund is known as Sustainable Use of Natural Resources and Energy Finance (SUNREF). Through SUNREF, the French agency channels a line of credit directly to local commercial banks in East Africa for onward lending to strategic projects. They include green energy projects (small-scale solar, hydro, wind and biogas plants) and those that are energy efficient. Aside from cheap credit lines, beneficiaries also stand to benefit from technical support from the French agency in the implementation of their projects. The local banks under the SUNREF initiative include Co-operative Bank, CBA, Bank of Africa and DTB bank. Back at DTB bank, the Transpaper executives proceeded to apply for the concessional loans, lower than market rates, and installed a fully automated line in the production of exercise books. Having been in operation for some time now, the energy efficient machine has translated to lower energy costs, with the benefits reflecting in end products in form of competitive prices, according to the executives. The automated production line is not only energy efficient but has ensured optimal output too. It churns out two million books per month. 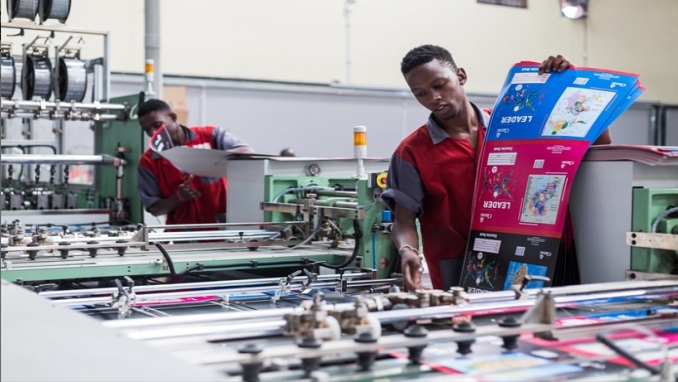 The factory in Uganda’s capital Kampala has a workforce of 70 people, manning different divisions, from book lines printing to book covers affixing. Besides exercise books, Transpaper, which was founded 60 years ago and with a footprint in Kenya, Uganda, Tanzania and Rwanda, produces paper materials for other printing industries, including newspaper and billboards. The company is just one among dozens that have received the cheap funding line under the French/local banks working relationship. “So far, we have 30 SME (small and medium-sized) projects financed to the tune of $75 million (Sh7.5 billion) in Uganda, Tanzania and Kenya,” the AFD regional director Eastern Africa Christian Yoka said. “The transition to a green economy has enormous development potential. Green growth brings opportunities in the private sector in the areas of energy, sustainable natural resources and environmental protection. As key players in private sector development, financial institutions can play a pivotal role in financing this transition,” the AFD said.